You have those dam Yankies traped ! Another great MOC - built to the generals orders. Can I ask, what about that Confederate submarine or steam-machine gun, now there's a chalenge ! Keep up the great work, The Brickster. Another very good Moc indeed. I like how you always capture your model/s to look like thay was really produced by TLC. there is always a nice selection of mini-figs. There is no overdoing in details, just clean and nice. I love how this collection keeps on growing. This latest addition is a really good one, especcialy since it contains a lot of usefull parts (for me at least). I also like the historical accurateness of the prison cart. It's also great to go with the Supply Wagon. Another instand classic in your fantastic Civil War theme. Can't wait to see what's next! You are single handedly rebuilding the Western Theme for LEGO. I hope your getting royalties for these, great work again@! The wagon looks too tall to me. I think if you were able to lower it by even one brick it would make a nice difference. Some kind of stand in the back for a guard to stand might be a good addition too, or perhaps a soldier on horseback. Right now the security seems too low. Your editing looks great. While the black backgrounds were fitting for a ghost town, this is much easier on the eyes and really shows off the creation. Really Great job with this MOC Brickster! It's nice and simple but looks Great! Looks like a good creation overall, but a bit too uniform for a lego set, at least color-wise. I don't know if it's your goal to make all your creations look like official lego models or what, but that's just my opinion. Very cool creations. I've always been interested in the American Civil War. I need to go on ebay or bricklink and get some WWs to mkae some cool Civil War MOCs like yours. This is again an absolutely amazing Western MOC, TheBrickster! It looks absolutely realistic - a prisoner transport was one of the things TLG really missed in the theme from 1996/97. 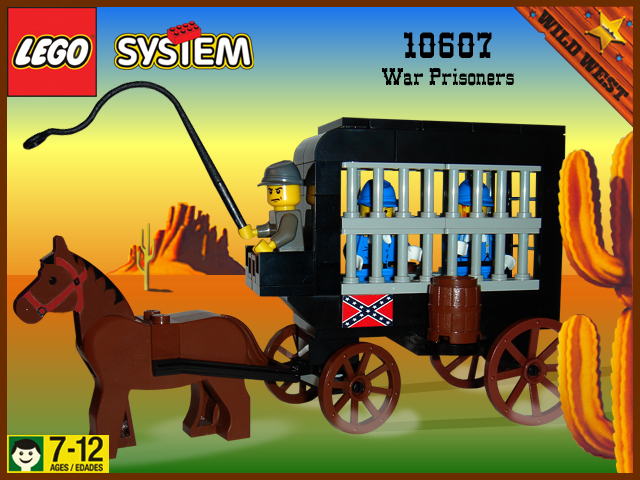 Another great confederate creation TheBrickster, I really love how you've use those black curved pieces. The light grey bars work great, which I'm surprised at, since normally light grey and black don't work together very well. The only thing I'm not happy with is the smaller front wheels. I get the look you were going for but I just think they are too miniscule. Still though another great entry, I'm off to comment on your others! Thank you all for the nice feedback. The wagon looks too tall to me. I think if you were able to lower it by even one brick it would make a nice difference. I didn't want to make it so tall, but I used the 6-stud high cell door piece in the back. It didn't leave me much choice, although the door works well. Looks like a good creation overall, but a bit too uniform for a lego set, at least color-wise. I think this has more color than a traditional LEGO wagon, at least compared to LEGO's official Weapons Wagon, which was all black. 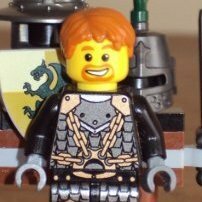 I need to go on ebay or bricklink and get some WWs to mkae some cool Civil War MOCs like yours. Great pieces. I see that WW sets are going for a pretty penny. Good luck. Nice Arms Wagon, it looks like it can also be used as a money or gold transport wagon due to its functionality. Thanks Z. Appreciate all your feedback. a prisoner transport was one of the things TLG really missed in the theme from 1996/97. I think a paddy wagon does make a great addition to the official theme (Confederate, Union, or even civilian). I really like your box art. Thanks, but I'm still trying to improve. I actually have a number of alternate boxart, some very custom that I never bothered to share. While I like using LEGO-style boxart, I'd like to create something unique (like my Grave Stone collection). I don't really want to copy LEGO, but rather have something original and creative. The only thing I'm not happy with is the smaller front wheels. I get the look you were going for but I just think they are too miniscule. Thanks B, but I actually like the use of the smaller wheels up front. It is funny though. I originally made a 6-stude wide wagon using four stude axles on both ends. Nice job on the wagon. It looks great. Serves those Yanks right.